With the goal of having a positive first impression for those entering Pennsylvania from neighboring states, PennDOT, in cooperation with the Department of Community and Economic Development, is in the process of replacing existing "Pennsylvania Welcomes You – State of Independence" signs with "Welcome to Pennsylvania – Pursue Your Happiness" signs at 37 state border highway entrances to the state. Existing signs were installed in 1997 and several partial overlays have been installed since that time to keep current with changing governor names. With an expected sign life of 18 years, these signs were ready to be replaced, and PennDOT took the opportunity to showcase the new state tourism brand, "Pennsylvania. 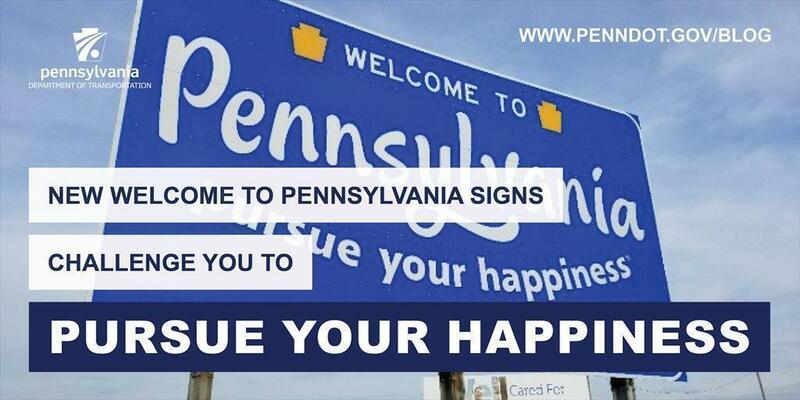 Pursue Your Happiness" by incorporating the new slogan on the signs. Signs were designed to be the same overall size as the existing signs, eliminating the need for new sign posts and foundations. All signs were manufactured in-house at the department's Sign Shop in Harrisburg.